Actor and Kansas City Royals baseball fan Paul Rudd stars in a new World War II movie premiering next month. He plays real-life professional baseball Morris “Moe” Berg in this espionage thriller from director Ben Lewin (Please Stand By). The movie adapts the true story of the catcher who became a World War II spy. The Boston Red Sox player was a private figure when, in 1944, the U.S. government’s wartime intelligence agency enlisted his services. His mission: To go behind enemy lines in Europe to assassinate the Nazi’s chief nuclear scientist before the Germans develop an atomic bomb. IFC Films is marketing the film as a high-stakes game of cat and mouse. The film stars Rudd along with Paul Giamatti (Cinderella Man, The Illusionist, The Amazing Spider-man 2), Mark Strong (The Imitation Game, Kingsman, Shazam! ), Jeff Daniels (Good Night, Good Luck, Radio Days), Sienna Miller (G.I. Joe: The Rise of COBRA, Layer Cake), Tom Wilkinson (Valkyrie), Guy Pearce (Alien: Covenant, Iron Man 3), and Wonder Woman’s Queen Hippolyta, Connie Nielsen. Adapted from a book The Catcher Was a Spy: The Mysterious Life of Moe Berg, by Nicholas Dawidoff, with a script by Robert Rodat (Saving Private Ryan, Thor: The Dark World), the film has a similar look and feel to other recent World War II espionage thrillers, like Tom Cruise’s Valkyrie and Benedict Cumberbatch’s The Imitation Game. Production design is by Academy Award-winning designer Luciana Arrighi (Howard’s End, Remains of the Day). Costumes were designed by Joan Bergin (The Prestige, In the Name of the Father, My Left Foot, Vikings). Three-time Oscar winning composer Howard Shore (The Lord of the Rings, The Hobbit) created the musical score. As predicted by Bob Gale in his script for Back to the Future II, it was the destiny of the Chicago Cubs to be playing–in fact sweeping–this year’s World Series. At least in the current alternate timeline we’re all living in, that just didn’t happen. If the Cubs hadn’t lost to the New York Mets they would have played Game 1 tonight at the home field of the American League champs instead of Wrigley Field because the American League won this year’s All Star Game. 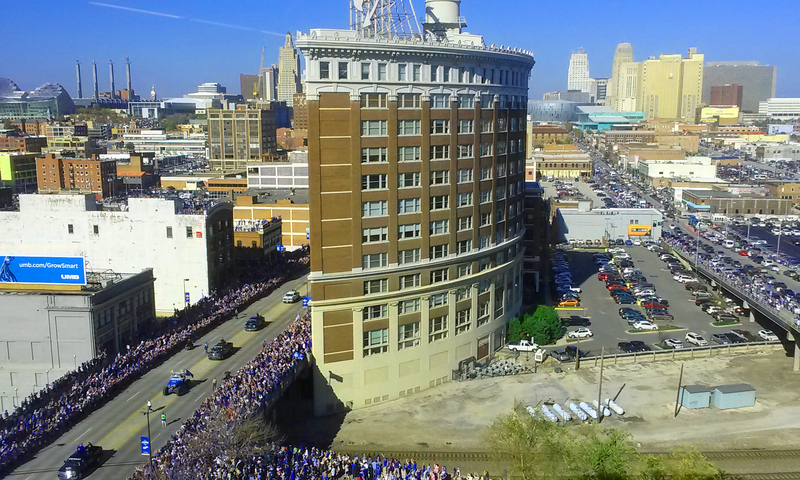 That meant Game 1 was played in Kauffman Stadium, and had the Cubs made it to the Series they would have faced off against the Royals last night in Kansas City. 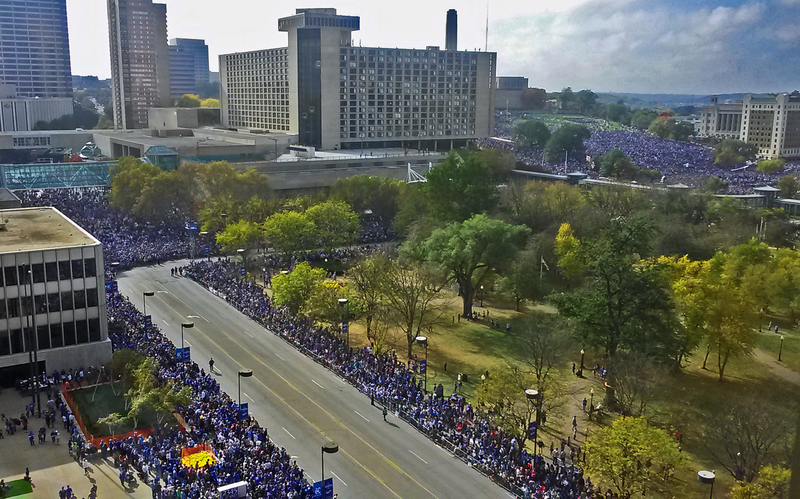 In that game we got to see the second longest game in World Series history–14 innings, ultimately with the Royals taking the win, 5-4. The bright lights at the stadium in the wee hours of this Wednesday morning seemed to actually burn into the wet night’s sky. Fourteen innings and more than five hours of exciting gameplay. 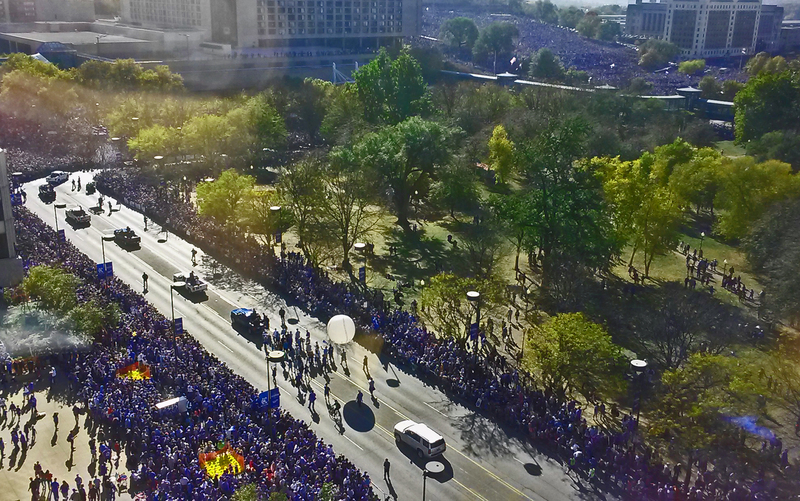 You can’t have a better World Series game than that–well, unless you’re a Cubs fan. 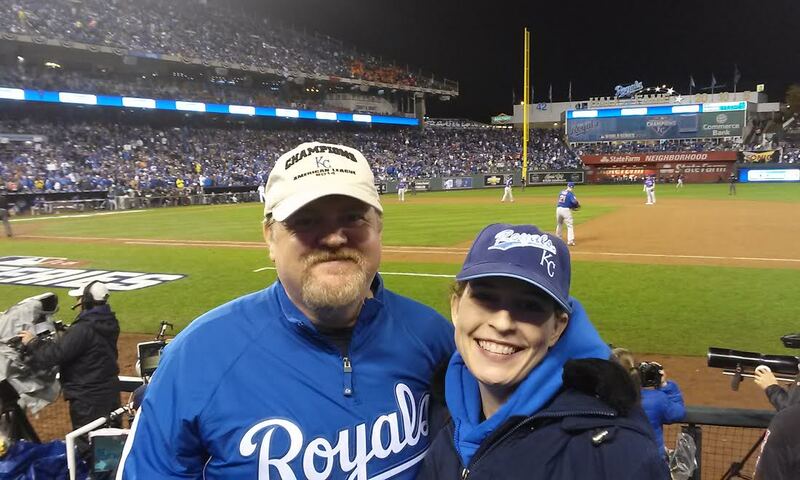 We did our part, yours truly and borg.com writer Elizabeth C. Bunce were bound and determined to see the Royals face off against the Cubs, because we’re sci-fi (and Royals) fans, and thanks to our friend Mike we watched Game 1 from dugout seats last night. Watching Lorenzo Cain steal second base when you’re sitting at first base… just can’t be beat. (And, hey, that stolen base means Taco Bell must give away free A.M. Crunchwraps on November 5, 2015, because they sort of lost a marketing bet in their Steal a Base, Steal a Breakfast campaign–see here for details). Major League Baseball has been producing bobbleheads since the 1960 World Series. 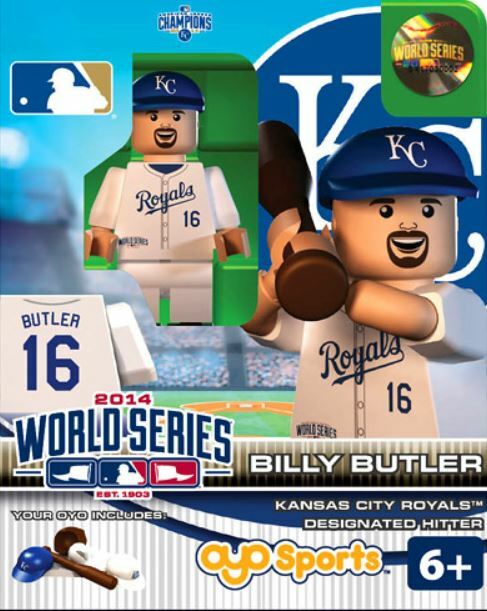 Now the Kansas City Royals, the 2014 American League champs, are ushering in a new era for collectors of bobblehead toys. As reported on the team’s Twitter feed, instead of issuing typical MLB bobbleheads for fans who attend designated game days, they are changing up the bobblehead designs for the 2015 season. The new figures reflect the personality of the groundbreaking team, which made it to the seventh game of the World Series against the San Francisco Giants last Fall. 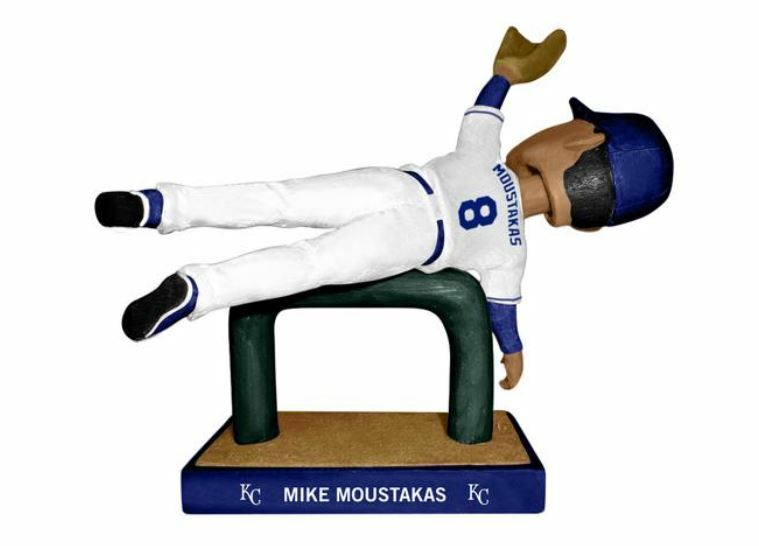 Each of four figures will be released at games highlighting players Mike Moustakis, Salvador Perez, Lorenzo Cain, and Yordano Ventura. This awesomely hilarious pose will be released at the Saturday, June 20, 2015, home game against the Boston Red Sox, and will likely be the most highly sought after edition commanding a premium for collectors on the secondary market. 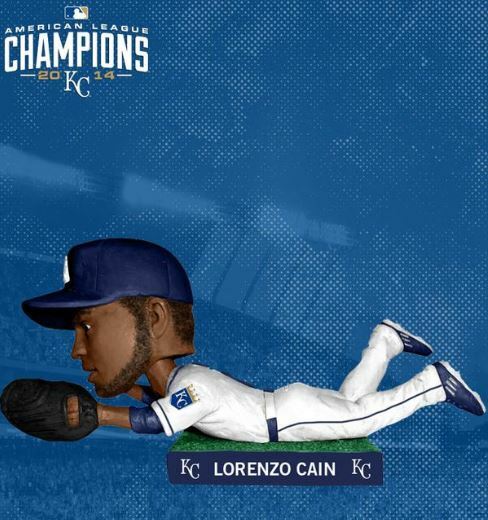 Also from the American League championship series is Lorenzo Cain in one of his spectacular dives. This will also likely be of the highest interest to collectors because of its vertical pose. Thanks to the magic of targeted Internet advertising, these Lego-ish figures streamed across the ad banner of borg.com this week and caught our attention. (You know how we like finding ways to talk about baseball here). Although they look at first blush like Lego knock-offs, these figures by Oyo Sports are fully licensed by Major League Baseball. Turns out, according to the Oyo Sports website, they seem to have been inspired by Legos, but attempt to go further by expanding the articulated movement of the standard building block figure. And you gotta love how they matched up the goatees with the players. 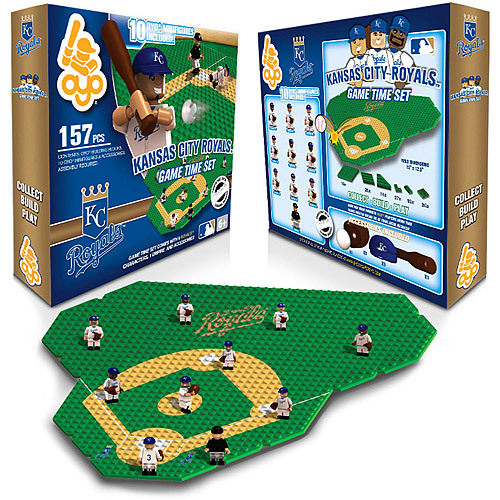 You can buy individual players or team building sets, and not just for the current American League and National League champs. You can get current players and retired players like Derek Jeter, Don Mattingly, and Bob Feller, or even mascots for pro and college teams, and figures from other sports. You can buy them on Amazon here . 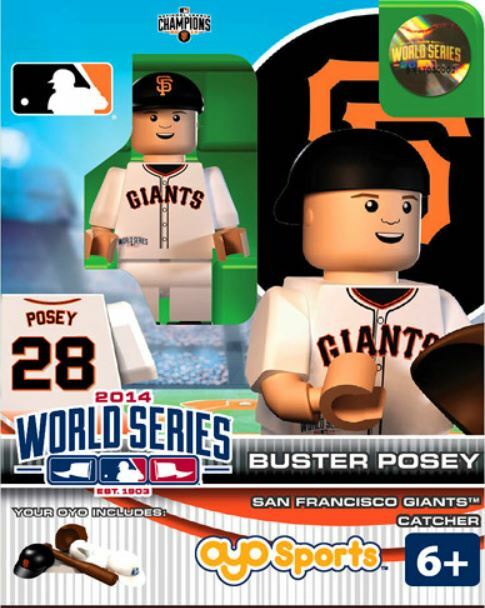 The playsets for the current World Series teams reminded us of the metal figures some Dungeons & Dragons players use to visualize their role-playing game. Maybe this could be a new twist on fantasy baseball? 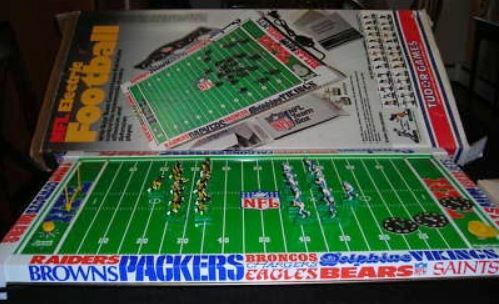 It’s the latest incarnation of sports table top play–remember electric football?